Since moving to Ecuador three years ago, I’ve had two marriage proposals from men I’d met only minutes before and several unexpected kisses (the real smack-on-the-mouth kind; not the air kind). These are the types of things that make you realize how different Ecuadorian culture can be compared with what we’re used to in the U.S.
I’d done my homework before moving to Ecuador. I’d read every “culture shock” book, article, and blog post I could get my hands on. I was prepared for the differences one invariably encounters in a new culture. I knew to tip baggers that carried my groceries to my car. I even knew yawning or pointing was considered rude, though staring was not. But what I obviously didn’t know was how to carry on a friendly conversation without getting a marriage proposal. But you know…some things just have to be learned by experience. 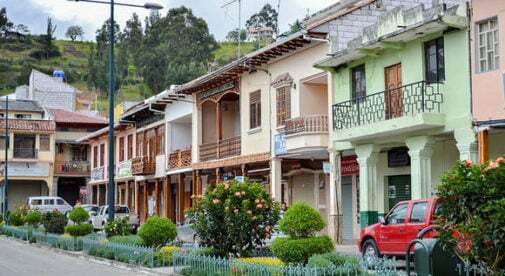 So, here are some cultural tips that I’ve learned since I moved to Ecuador. Hopefully they’ll help you avoid making the mistakes that I did…or at least make you feel less embarrassed when you do. And we all make mistakes…if nothing else, they’ll make for amusing stories to share with your friends back home. Don’t panic if you see your taxi driver suddenly cross himself. It wasn’t a narrow miss (most likely). You just passed a church or a roadside shrine, and didn’t realize it. Jaywalking is legal…but you do not have the legal right-of-way. Go fast or go splat! Drivers in Ecuador are actually quite skilled at avoiding accidents. Their expertise at driving is the only explanation I can come up with for why there are so few accidents in a country where drivers take “traffic laws” as friendly traffic suggestions. That, or maybe crossing themselves at every church and roadside shrine really does make a difference. Latinos are skilled flirts. Have fun and don’t be intimidated. Be aware, however, that flirting back can lead to marriage proposals…even if you just met five minutes before. It took a male Ecuadorian friend explaining, “You must have flirted with them,” before I figured this one out. If a passerby offers you an item (candy, gum, etc. ), assume he is offering it to sell. He is not gifting it to you. These vendors will sometimes come on public buses or into restaurants and pass around packages of gum or candy. If you do not want it, just leave it on the table. He will collect it when he goes around again. There’s always a learning curve for any new culture. Courtesy, respect, and an infinite sense of humor are key. Keep a smile on your face, jump in, and go for it. Ecuador is a lovely country and its people are truly warm and gracious. Oh, and remember, when you ask the vet for flea powder and he sniggers, he’s not laughing at you, he’s laughing with you…because you didn’t ask for powder to kill fleas (pulgas). You asked for powder to kill prostitutes (putas).